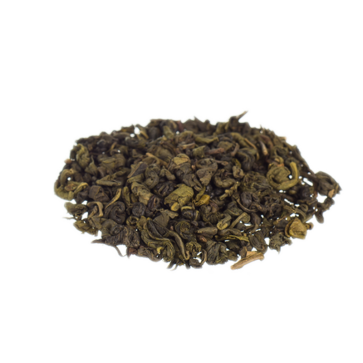 This Gun Powder tea is a variety of green teas from China. The leaves are rolled into small pellets, which resembles the 18th century gun powder. It contains a lot of antioxidants and tannins, and stimulates your metabolism. The leaves of the Green Gun Powder Tea are rolled into small pallets. This method of rolling the leaves is applied to both dried tea or Oorlong tea. The production of this tea can be traced back to the Tang Dynasty. The Chinese refer to this tea as ‘pearl tea’, and the English name probably originated in the 18th century due to its similarity with the black gun powder. Another theory however, is that it comes from the Mandarin Chinese name for freshly brewed tea ‘gāng pào de’ which resembles the sound of the word gunpowder. The way of making green tea ensures that most of the nutricious and healthy components are preserved during the process, which allows for their release into your cup of tea during the infusion. This Green Tea contains many antioxidants, some of which are said to be more powerful then vitamines C and E. It also contains a lot of tannins, which work calming on your nerves. Although too many tannins are not healthy for the body, a cup of Green Tea contains way less then Black Tea does, and therefore is considered to be more healthy. Green tea should not be made with boiling water. Let the water cool down to 70-80 degrees before pooring it over the leaves. Use 1-2 grams per cup (250ml) and let it steep for about 2-3 minutes. 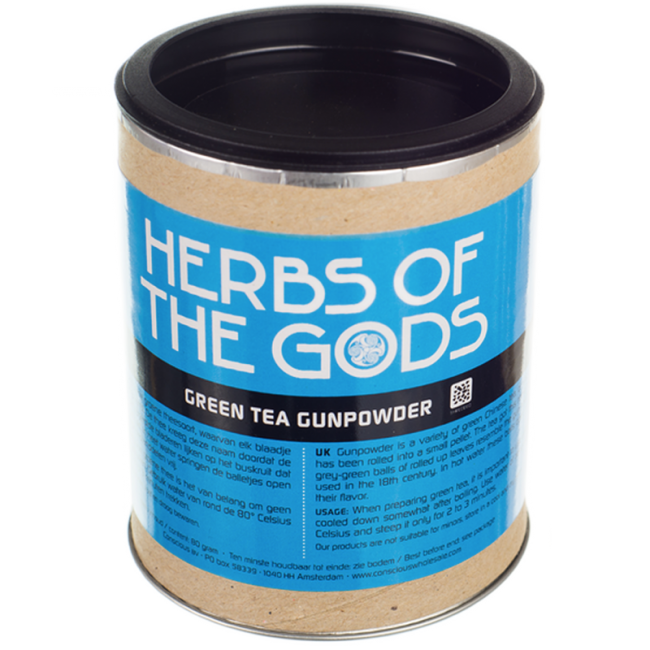 Herbs of the Gods have collected high quality herbs since 1999. They have a selection of relaxing, stimulating and psychoactive herbs, that can be consumed by eating, drinking in teas or with a vaporizer.